I first got struck by this idea back in 2010. 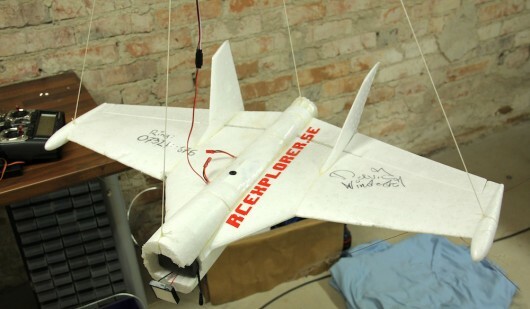 The idea of sending a RC plane that I could control via FPV into the stratosphere really gripped me. I didn’t have close experience needed to get a video link to work that far, nor an RC link. So I filed in the back of my mind with the label of a dream. Two years later I had the experience, the knowledge and the funds to finally try to make that dream a reality. First choice I had to make was which airframe to use. I needed something small, light, strong, spacious fuselage, capable of carrying a gopro, with good wind penetration and reasonable glide ratio. In my mind choice was simple, a FunJet. It easily for filled all my requirements and I already had a lot of experience flying it FPV. Unfortunately Multiplex announced that they would stop making them in favor of the much heavier FunJet ULTRA. So I quickly bough two before they became scarce. Before we go on I have to say that this project has been cursed for me. I lost almost all pictures of the build except the last ones. So unfortunately I’ll have to use words to describe what I did rather than show it. This is the Space FunJet on the eve before the launch. There were a lot of things to take into consideration when building the Space Glider. For instance, during the ascent the temperature can drop to minus 40 or even 50°C. I had to make sure that the electronics, batteries and servos all could survive and operate with such a harsh environment. The servos took some time to figure out. After a lot of testing I came up with a solution that worked well. First of all you have to remove the grease in the gears. The colder it gets the thicker it becomes. Second thing I did was mounting the servos inside of the fuselage, where hopefully they would stay nice and warm. I used “U” shaped control linkage and mounted the servo with the output shaft in the middle of hinge line of the control surface. That way I could mount the servos in the back where I had the most space. It also didn’t hurt to have the weight in the back as I had the camera up front. 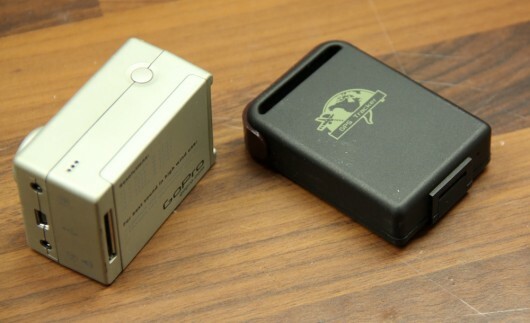 The video transmitter I ended up using was the Lawmate 1W 1.2GHz. If I could go back I would probably chosen a different one. But I already had this one and the range tests with a Old Man Mike Optimized Pinwheel + The Gatling receiver antenna were satisfactory. This transmitter gets quite hot while running. Normally that is a problem, but in this application it is actually very welcome as it will keep the rest of the electronics warm inside of the fuselage during the ascent and decent. To make sure that it didn’t overheat while at the ground and low level altitude I installed a small 40mm fan next to it. This also helped distribute the heat throughout the fuselage during the extreme cold section of the flight. However a fan is only effective when the air is sufficiently dense. Which it is not at the peak altitude. Even though it’s really cold up there, there is no air to absorb and move the thermal energy, which means that the video transmitter can overheat even in sub zero temperatures. Therefore it’s also important to have something to absorb and move that heat that is directly connected to the heat source. I used the 1S 2200mAh liPo battery that I powered the GoPro with. 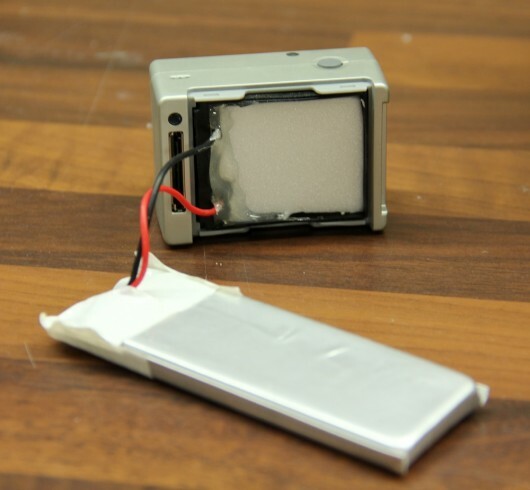 Here is that battery. It’s just one cell I took from a 3s2200mAh where the other two cells were damaged in a crash. The GoPro draws ~450mA when recording in 1080p and during my tests the original 1100mAh battery lasted for a little more than 2 hours in room temperature. The 1s2200mAh battery lasted well over 4 hours. 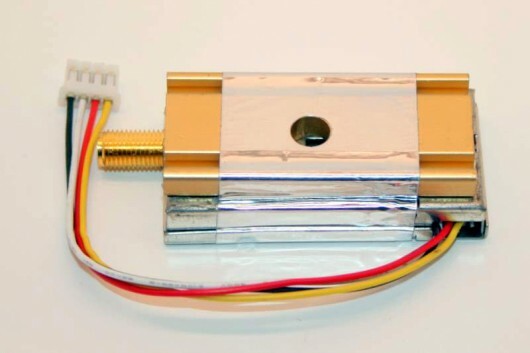 LiPo’s really don’t like being cold, the voltage drop increases dramatically. 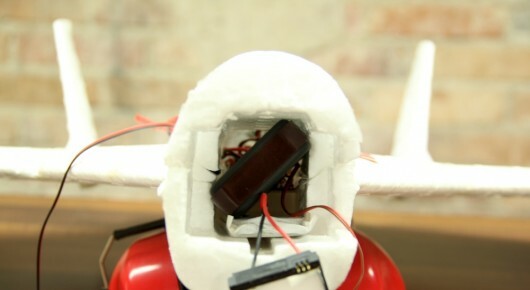 Having the video transmitter strapped to the battery ensured that the battery kept warm and cosy through out the flight. While were on the subject of batteries I might as well talk about how I powered the video transmitter and the rest of the electronics. 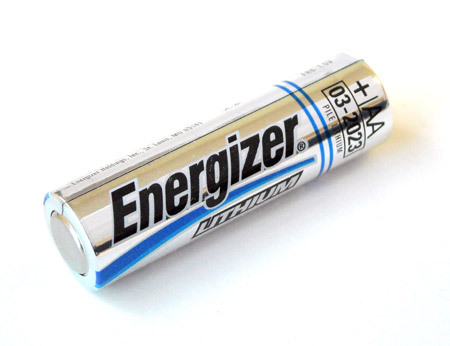 I did some research, a while back for another project, on which the most energy dense batteries that were easily obtainable and I stumbled across the Energizer Ultimate Lithium AA batteries. The reason I remembered these batteries were that they were rated for use in temperatures down to -40°C. They are non rechargeable, disposable, 1.5V (1.8V unloaded) Lithium/Iron Disulfide rated at 3000mAh at 250mA (21°C). (Click here for the spec sheet). I picked up a couple at the local grocery store to try out, and they are quite impressive. At of 1A continuos discharge in -20°C temperature I got 2600mAh before the voltage dropped bellow the the sync voltage of the video transmitter. The electronics in the plane didn’t draw more than 500mA average current, which means that the battery should last at the very least 5 hours. I simply soldered 8 batteries together in series to make a 12V that only weighed 120 grams. Less than half than the weight of a 3s3000mAh and much more temperature tolerant. Just in case I didn’t manage to land the plane at my feet, I installed a GSM GPS tracker. It’s pretty straight forward to use. Simply send a text message to it and ask where it is and it sends a text back with the coordinates. I got it of ebay a year previously, unfortunately I can’t remember the manufacturer of it. Made sure that the GPS tracker fit in the fuselage. I left the GPS tracker unmodified with it’s original battery and simply wrapped it in a balloon to make it water resistant. To be able to release the plane from the balloon before it burst, I made this simple rope cutter. 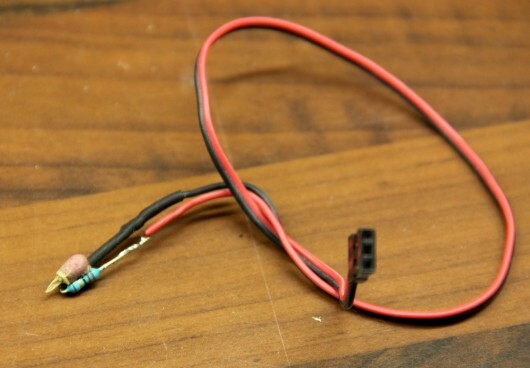 It’s just a 10 ohm resistor that is hooked up to a RC switch. When I activate that channel on the receiver 12V is applied to the resistor. Ohms law tells us that the current passed through a 10 ohm resistor at 12V is 1.2A. That is 14.4W, way more than the 1/4W the resistor is rated at. This will make the resistor heat up to the point where it’s so hot it starts to glow. It doesn’t burn out straight away, in fact it usually last for 10-30 seconds before finally burning up. This energy is plenty to melt the rope and release the plane. But just in case, I glued a match head to the resistor, to give it a bit of a boost. When the match ignites it’s self oxidizing, which means that it creates it’s own oxygen and can therefore burn (for a short time) in a vacuum. This is the same method I used to remotely ignite fireworks in RC Tank Battle and Hunting hydrogen balloons video, so I know it’s reliable. To have the plane rock as little as possible during the ascent I anchored in the four “corners” of the plane. You can also see the cut down system in place. The JST connectors on the outside of the fuselage is to activate the electronics on the inside. To measure the altitude of the balloon had to use a barometric pressure sensor (BMP085) hooked up to Arduino mini. Nearly all GPS receivers have a hight limit of 18km and a speed limit of 1852km/h, after which they stop functioning. Some GPS units function above this altitude, but they are scares and hard to come by. This is a restriction built in to the software ,so the GPS can’t be used to control missiles. A friend of mine helped me write the code to read the data from the pressure sensor and store it. I’m not going to pretend to know half of the code and unfortunately he doesn’t have the source code saved anywhere where he could find it. But he said that the code was mostly copied straight from the example code here. 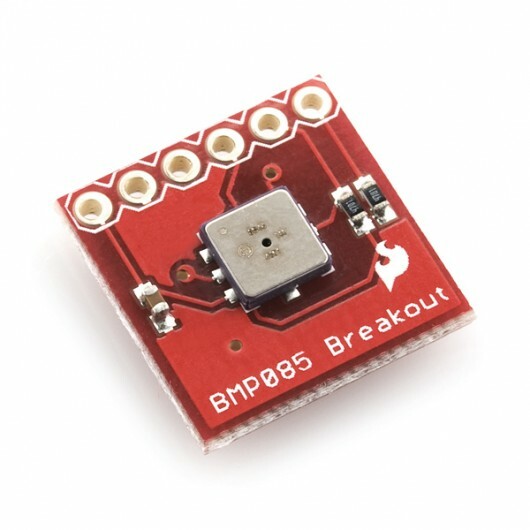 The BMP085 pressure sensor is only rated down to 300 hPa but as many others before me has concluded is that it’s solid way bellow that. To control the plane I used the OpenLRS long range system from Flytron, hooked up to my Aurora 9 radio. The stock OpenLRS is not that long range so to get the range needed I used the 7W booster they sell as well. I ran it at around 2W hooked up to a 4 element DIY Yagi 9dBi antenna. On the receiver I used a DIY Turnstile antenna. If I for some reason would run out of range on this setup I could easily increase the voltage to the booster and jump it up to 7W. All the the range tests I did were solid at 2W, but it’s always a nice comfort to have that extra oomph in your back pocket. The balloon I ended up using. It’s a cheap army surplus sounding balloon. 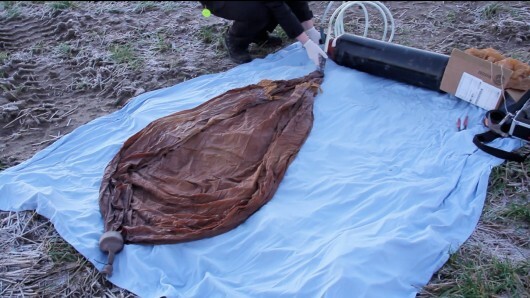 It’s advertised as a 2200 gram balloon on ebay. 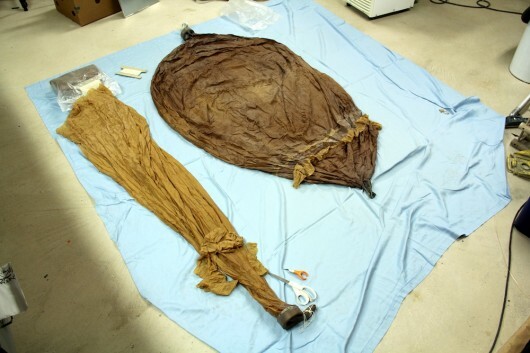 But once you cut of the apron, it’s roughly equivalent to a 800g balloon. The reason I chose this balloon was mainly that it was cheap, easy to get and already proven. Many others have used it in their space missions with success. Normally you use helium to fill the balloon. But where I live helium is ridiculously expensive. So I went with the much cheaper alternative, hydrogen. It’s also more buoyant, about 8% more. Which means a higher burst altitude as you can use less gas. But it’s also extremely flammable and very easy to ignite, even with just static electricity. So if you don’t know what you’re doing I highly recommend staying away from it. To know how much you need to fill the balloon you can use this calculator. I substituted the weight of the payload and the free lift I needed with a hammer and a roll of MIG welding wire. As soon as the ballon could lift that weight I knew it was time to stop filling it. Another tricky bit about any space mission is to predict the flight path of the balloon. There are so many factors to take into consideration such as jet streams, masses of air layers moving different directions is just mentioning a few. I found this awesome balloon trajectory forecast, where you just input the launch coordinates and it gives you a google earth KML file with the whole flight path. It’s spooky accurate as well. The ballon burst at almost the exact spot it predicted. I highly recommend using it if you’re planning a space mission of your own. I did record the video from the ground station, or at least I though I did. I started the recording, but for some reason the sandisk V-mate decided to stop recording after 12 seconds. So I lost that video. I also forgot to start the GoPro I had in the car in all the commotion. So unfortunately the only footage I had left after the very intense day were from the plane. Unfortunately I failed the mission I set out to do. But now I’m an experience richer, plus I got really cool footage. 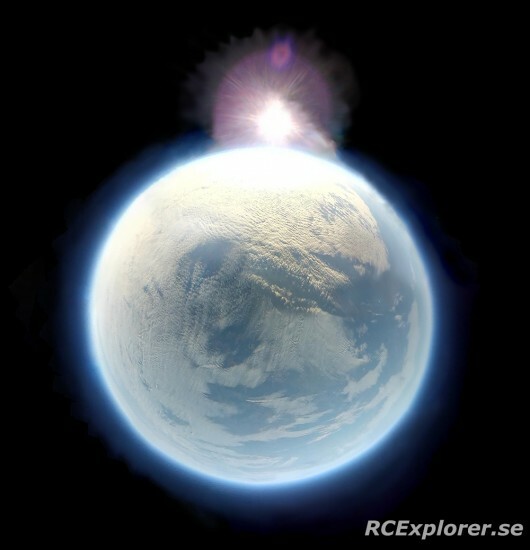 33103 meters above sea level (+-10%) 67 minutes after launch. Balloon burst. Note the shadow of the plane in the balloon. I stitched this photo from 50 still frames from the video. 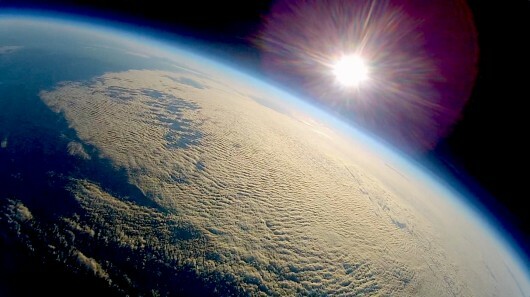 It’s not really the whole earth, the curved lens of the GoPro just makes it look that way. Total flight time was 108 minutes. Total distance between launch and landing site was 101km. ← UFO caught via FPV! Seems like you’ve out-done yourself this time David! Very cool video. The images were a lot better than many balloons I’ve seen before. I hope you try again. That sure inspires me to try as well! Really cool mission and great footage! Just out of curiosity what firmware was used on the openLRS? This is somewhat biased question as I’m making the openLRSng and could maybe use your expertise as input for my work. I wouldnt call it a failure! Though things didnt go as you hoped it was still an amazing feat for sure! Absolutely incredible. I think you may think of this as a failure, when in fact that things didn’t go to plan added to the sense of adventure and drama. Too many unanswered questions though so I hope you will do a making (and finding) of video. How long did it take you to find it? Was that an adventure in itself? More please! This project is great and I think you should do another attempt to reach your goal (landing at the starting point). Please tell the end of the story too. How do you manage to find your plane after all ? Did it still was transmitting video ? Great project! Where can we donate money to send David back to space? Wow David thats inspiring! Excellent work. Hope you repeat the mission soon! Do you consider the UHF causing video loss? 1280Mhz is neer the 3rd armonic of your LRS system. You can try shielded USB cable or Cat-6 sftp cable for your video tx / OSD connection. I agree, this wasn’t a failure, just an adventure that didn’t go as planned. What does? It was a lot of fun to watch the video and read your story! Isn’t your GPS device an XEXUN TK102 maybe a TK102-2 device? Congratulation. Your mission is even recognized from Hackaday. Saw it on Popular Science too! Wow this is simply amazing! Damn, great work guys! One question, you say you would not use the Lawmate 1W 1.2GHz again. Can you please tell me what TX – RX combination would you use? While your technical achievement is nothing less than stunning I can’t help but raise some concern about the potential impact to the RC hobby and by extension the RC industry. While I realize these comments won’t be popular here I feel compelled nonetheless to point out the negative effect this can have. Here in the US there is a debate raging at the highest levels of government regarding the use of UAS/UAV technology. As it stands right now the RC hobbyist is caught right in the middle with FPV the main issue. In the eyes of some in law enforcement the difference between an RC plane/pilot and a UAV is FPV. Your video only confirms this. In the past 2 weeks alone I have seen your video, another video showing an FPV heli being flown into a blade on a 1.5Mw wind turbine, and heard of a US commercial airline pilot reporting a quad-copter UAV at less than 200 feet from his aircraft while on approach. The RC hobby relies heavily on its users ability to self police. If we can’t be trusted to do the right things then surely someone will step in and force action through more regulation and that won’t be good for the industry as a whole. I’m not sure if this debate is as sensitive outside of the US but I suspect if officials here put enough pressure on the RC enthusiasts we could see a huge impact on the industry which in turn would forever alter the economics of the hobby, regardless of where you live. All I’m saying is your “mission” was brilliant but it should have been coordinated with local aviation officials and law enforcement. Perhaps it was but I didn’t see or hear any mention of this. and Autopilot Systems) adopted for the legal FPV use on US. Also for your information UAV is for unmanned, every radio controlled airplane ,FPV or not FPV is under this category. The misinformation and “drone” propaganda dont work here. If safety is your concern visit the AMA website , look for the FPV safety guide and you will notice that , even that David is not flying on US, he follows the rules by the book. FPV flyers know the laws and safety rules that apply. Also, you forgot to saw the other videos of people who already have done near space missions with the same meteorological ballons on NY and other US states. Wind turbine blade?! haha our planes are like mosquitos for those , also no law prohibits it ;). If you feel uncomfortable with FPV, then dont do it. luily3d….Your answer is complete rubbish. First and foremost it makes no difference where the flight took place. Thanks to youtube here we are having this conversation. The world is a very small place these days. After all that’s how I came across the video here in Cleveland, OH. What one person does, even in Sweden,affects us all. As far as your AMA argument goes it seems that Aeroheadtw already covered the basics. In short David wasn’t even close to the AMA guidelines regarding line-of-site or a spotter. Moreover you really missed the whole point of my comment. This isn’t “drone misinformation” and I assume anyone visiting this blog knows that all RC planes are unmanned by definition however the real difference is the ability to fly these “unmanned” aircraft beyond visual range. In fact until FPV came along this was the MAIN difference between the rc hobby and UAS/UAV’s Now that line has been blurred and lacking any sort of internal policing, outside forces will step in to regulate against people like David. You don’t seem to understand that siting public safety codes that don’t prevent David’s type of “mission” from taking place will only encourage lawmakers to change those codes to account for the new reality. PERCEPTION IS REALITY and the perception right now is that FPV RC is potentially dangerous. Plain and simple. You might be like mosquito’s to wind turbines but did it ever cross your mind that regardless of your view that the owners and operators of these wind turbines don’t want you and your irresponsible friends touching their wind turbines? Are you 12 years old and can’t understand this? At the end of the day your biggest misconception is that what happens in Sweden stays in Sweden. Overzealous regulators here in the US cite videos like David’s as further evidence that the RC hobby can’t be counted on to self-regulate and therefore must come under federal and local control. If they succeed in bringing the RC flying industry down in the US the economics of the hobby would change for all, including you and David. Without the US market helping to give the industry better economies of scale everyone else will pay more for everything related to the hobby. Undoubtedly some rc suppliers will simply go out of business with access to a market as large as the US, leaving you and David potentially holding the bag. Lucky the rest of the world doesnt rely on Us law makers. Here in Switzerland, and all over Europe, regulators have taken a much more pragmatic approach. I’m so sorry that our Freedoms affect you so negetavily – in “The Land of the Free” lol. But even if David W is flying in Sweden, it’s not worth risking sending an airliner down–not to mention terminating our hobby. Just because there isn’t a law against it doesn’t mean it’s a good idea. Also someone here comments authoritatively on the thread about David following AMA guidelines even though he is not bound to; fine but ummm, one of the guidelines is line of sight (which was lost to cloud cover seconds after launch; forget about altitude and distance rendering the plane unseeable) another guideline is having a spotter (his companion was driving the car, not spotting the invisible plane). I love this aspect of the RC hobby; but actions like this will love it to death. It’s not likely that an airline would get tagged, but could you live with yourself if something went wrong with your self-described “cursed” project? Additionally a dozen states here are on the verge of various shades of outlawing any aerial photography and any sort of UAVs–let’s not feed the misinformed and ignorant more fodder for their over heated fantasies! This is a tough one. On one hand, david’s work is something to marvel at. On the other hand, where do we draw the lines? For example, what if David had decided to use his expertise to attach a legally purchased firearm to his glider. Would that be alright? Bottom line is if David did not do this then someone else would have. Anyone who thinks self policing and self regulating personal behaviour is possible is dreaming.The laws will work themselves out regardless and if what you want to do is safe you will probably be OK.
Perhaps iKant. But self policing forms norms useful in distinguishing activities that fall outside the bounds. While appealing in a non committal way, I find your view overly Panglossian (“the best of all possible worlds” with change beyond our human ability; but maybe the follies of Candide have me addled). Create ‘norms’ will not protect you from having your rc vehicles outlawed by new drone legislation. In fact, if anything David’s experiment should be praised for pushing the discussion ahead of new laws so that recreationists are not squeezed out. Legislation is currently on the tableto outlaw anyone, including police from using any unmanned aerial vehicle to gather any data – even for criminal cases. So, having a camera on your UAV is going to be a criminal offense. Doing nothing is tantamount to being outlawed. The RC community needs to get ahead of this now and not stick its heads in the sand. I have to say that this is the most inspiring, impressive, calming, and beautiful project I have seen in a really long time. I really enjoyed the video. I will be doing something similar this summer, and will share my progress with you. Too late. Hobbyists will not be the force to define allowances and restrictions, so his actions (of which he should not care crap about US laws) will be designed based on others anyways. is there some kind of beacon i can use? im thinking of launching in the early morning, and putting great big blinky red lights on it… any other suggestions? It’s wonderful! Thanks for sharing.I think you’ll like it. I really enjoyed the video. I will be doing something similar this summer, and will share my progress with you. i am a little confused about the helicopter,does it can fly in outer space ? hey you might want to see this. Before you think about this…checkout FlightAware.com/live/airport/Browse by airport. This ought to scare you to death. If Not..just try to get an FAA Wavier..especially Florida. I know one guy got a $30,000 fine, because he did not have a wavier. First of all Thank you David for all your selfless work in the hobby. 2nd of all, to those who think that David’s experiment caused any undo danger to any aircraft; consider that NOAA does the same thing about 7500 times each year. My last message was supposed to say that NOAA releases about 75,000 weather balloons each year. 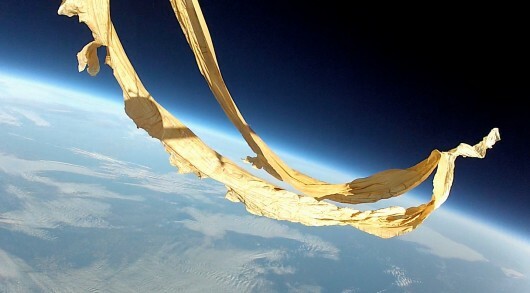 Not only that – high altitude balloon flights are a hobby in and of itself – check out David Akermans amazing stuff sending Raspberry Pi’s into near-space etc. First i like to say thanks for all the inspiration . You got me into the hobby of rc (got a rcexplorer tricopter and a Bixler with FPV), and now i and 2 friends are planning on a spacemission simular of your. You are correct about helium being expensive here i Sweden and i’m trying to get hold of hydrogen. Where did you get hold of yours? 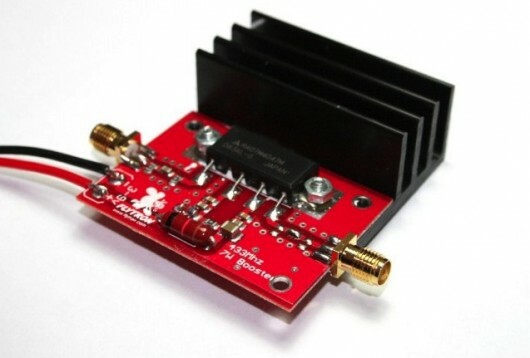 What transmitter would you now use instead? Im currently working on a space drone. I would like for you to email me please. I plan to have it circle twice. Im scheduled for a news conference soon. Im currently looking for sponsors like dragon link. all of my money is running short for this I’m so close I can taste it.. However, always verify with your local gov agency responsible for regulating airspace before even investing time and money in such projects. 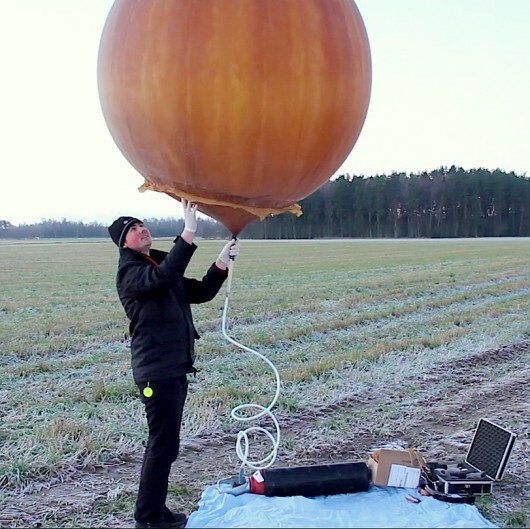 For instance in the US it is NOT legal unfortunately to track air balloons with a gps device and cellphone connection. It is also not allowed to drop an rc airplane from a weather balloon.This has been so for quite some time…regardless of the reasons, one should always know what are the standing rules. David, how the h*ll did you get permission to use those kind of outputs on those frequencys? I cant seem to find any frequency allocations in those band that permits those kind of output powers for non licenced use. Is the equipment even legal to use in Sweden? PTS (post och telestyrelsen) might have the answer for you on that one David. Radio amateurs can transmit up to 1kW (1000W or 1000000mW) on the 70CM (432-438MHz) band as well as the 23CM (1240-1300Mhz) band in Sweden. And ATV (amateur television needs to have the callsign visible in picture all the time for identification. I can transmit 1KW on all those frequensys, legally. I’m surprised the FAA didn’t stab you for this. Actually it was 100% legal at the time. All you had to do was call them and tell them when and where you were releasing the ballon. I know it’s been years since your flight but see that you still reply to posts. I don’t know if it’s been mentioned or you know about windy dot com ? Windy is a great website for seeing wind speeds/direction and future wind predictions at different altitudes/Flight Levels. Hope you try this again and have more success landing at your feet or starting point.